We invite you to explore India - the Land with infinite beauty ! Whether you soar high into Himalayas or peer under the ruins of the Ancient monuments dotting the landscape of India, you will cherish the experience long after your visit ! This India Travel Guide on Swamimalai Temple is free from any commercial interest! This site is dedicated to promote India - the vast subcontinent, its glorious past, magnificent landscape and its infinite variety. Swamimalai is a panchayat town located near Kumbakonam in Thanjavur district in Tamil Nadu. Swamimalai means 'God's mountain'. It lies on the banks of river Cauvery, on the road connecting Kumbakonam and Thiruvaiyaru. It is one of the six ‘Padai Veedugal’ (Battle Camps) of the Hindu God Muruga. Swamimalai boasts of having the only school that teaches the art (craft) of making bronze icons. The temple is built on an artificial hillock about 60 feet high. It has sixty well-laid steps leading to the temple top. The sixty steps represent the Hindu cycle of sixty years. It is here at Swamimalai that Muruga explained the meaning of pranavam (AUM) to his father, Shiva. Son ( Muruga) became the Guru and the father ( Shiva) became the disciple. An intense debate regarding the pranava mantram (AUM) takes place between Brahma (the creator) and Karthikeya. Brahma fails to convey the meaning of AUM as per requirements. Hence, Karthikeya suspends Brahma from his duties and imprisons him. Shiva intervened and asked Murugan whether he himself knew the meaning of the powerful Pranava OM. Muruga said that he is aware of the meaning and promised to teach him too, if he can treat him as his Guru and listen to the preaching as a committed disciple. Shiva accepted the condition and heard the description of OM as a faithful disciple in this place. Muruga in this temple is also known as Swaminathan and ‘Thagapan Swami’ meaning Father’s God. The temple has three prakarams or enclosures and three entrances. The main entrance faces south where one can find majestic Raja gopuram (main temple tower). The outermost prakaram of the temple is at the ground level. The second one is located along the stairs, and the innermost prakaram is around the Swaminathan shrine. There are many small temples at the lower prakaram, of which a temple dedicated to Meenakshi and Sundareswarar is significant. Between the innermost prakaram and second prakaram, there is a temple of Netra Vinayagar (Lord Ganesh who blessed a devotee with eyesight) and shrines of Karthaveeryarjuna, Idumban and subramanya swamy. At sanctum sanctorium, main deity Swaminadha, a six feet idol, with elephant as his vahana (vehicle) instead of peacock looks enchanting. The theerthams (divine sources of water) of the temple are Vajra theertham, Saravana Theertam, Netra Pushkarini and Kumaratturai (Kaveri). 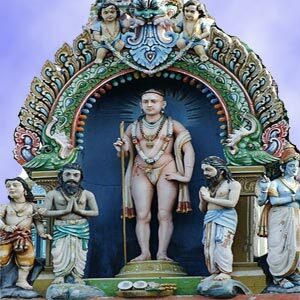 Prominent festivals celebrated in Swamimalai include Skanda Shashti festival in October, Monthly Kirutikai festival, Temple Car festival in April, Visakam festival in May, Navaratri festival in May, Tiru Karthikai festival in Nov/December, Tai pusam festival in January; and Pankuni Uttiram festival in March. The temple possesses a magnificent golden chariot made of gold, silver and other metals. It is always beautifully lit and will be taken on a procession around the outer corridor. The temple is located close to important temple towns like Kumbakonam, Papanasam, Tiruvidaimarutur, Mayiladuthurai, Tanjavur etc. Swamimalai is well connected by rail and road. Kumbakonam is about 6 kms away and is the nearest railway link. The nearest airport is Trichy, which is 90 kms away.